WASHINGTON (AA): President Donald Trump signaled Monday the U.S. is slowing its withdrawal of 2,000 troops stationed in Syria. The announcement appears to be at odds with Trump’s original declaration in which he vowed an immediate removal of U.S. forces from Syria and the defeat of the Daesh terrorist group. But the new timeline for the U.S. exit remains unclear. 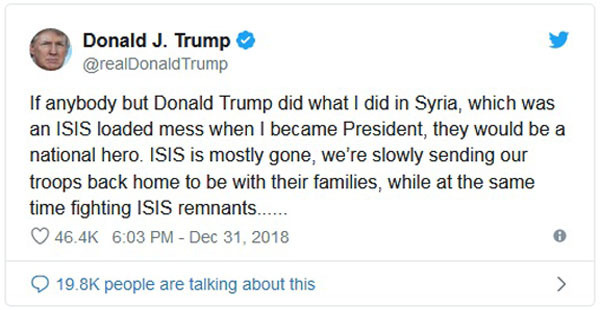 “ISIS is mostly gone, we’re slowly sending our troops back home to be with their families, while at the same time fighting ISIS remnants,” Trump said on Twitter, using another name for Daesh. Senator Lindsey Graham, a close Trump ally but fierce critic of the announced withdrawal, said after having lunch with the president Sunday he thinks “we’re slowing things down in a smart way. “I think we’re in a pause situation where we are reevaluating what’s the best way to achieve the President’s objective of having people pay more and do more,” he said. Graham has been one of a number of Republican critics of the planned withdrawal, arguing that it would embolden the Syrian regime and its main allies — Russia and Iran, while undermining the fight against Daesh. Trump staunchly defended his decision in a series of tweets in which he took aim at his critics. “I campaigned on getting out of Syria and other places. Now when I start getting out the Fake News Media, or some failed Generals who were unable to do the job before I arrived, like to complain about me & my tactics, which are working. Just doing what I said I was going to do!” the president said. Trump did not specify which generals he was referring to but his outgoing defense secretary, Marine Corps General James Mattis, resigned following the withdrawal announcement, issuing a barbed resignation letter in the process.